When you choose Riley's White Glove Delivery, you are making a smart choice. We do all of our deliveries with our own drivers, in our own trucks. We control the whole delivery process from start to finish to make certain it gets done right, the first time. 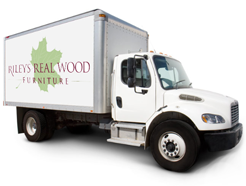 Our delivery crew has years of experience in furniture delivery and handling as well as being very knowledgeable about the products they handle. This ensures that when you use our delivery service, your new piece gets into your home without damage to it or your home. Before your purchase leaves our warehouse, each piece is carefully inspected to verify quality and check for damage. Then everything is blanket wrapped for protection and secured in our truck for a safe ride to your home. Once we arrive at your home, we do all the work for you. Our drivers move everything into your home and put it right where you want it. Any assembly and packing-removal is done for you. If you have a special need at your home, we are glad to accommodate you. Whether it is removing our shoes, attaching something to a wall, or moving your old furniture out of the way, we have you covered. Starting at just $50 for delivery in the Eugene and Springfield area, all of our deliveries are a flat-rate. Our pricing is based on where you live, not how much you buy. So no matter how many pieces you order, you still pay just one low price to have them all delivered. We deliver to almost the entire state of Oregon and parts of California and Washington. The following list contains a sampling of our most serviced areas and rates. You will be given an exact rate during checkout, or you can call us to get a personalized rate over the phone.